Introducing our newest project to complete: www.RushHal.com. 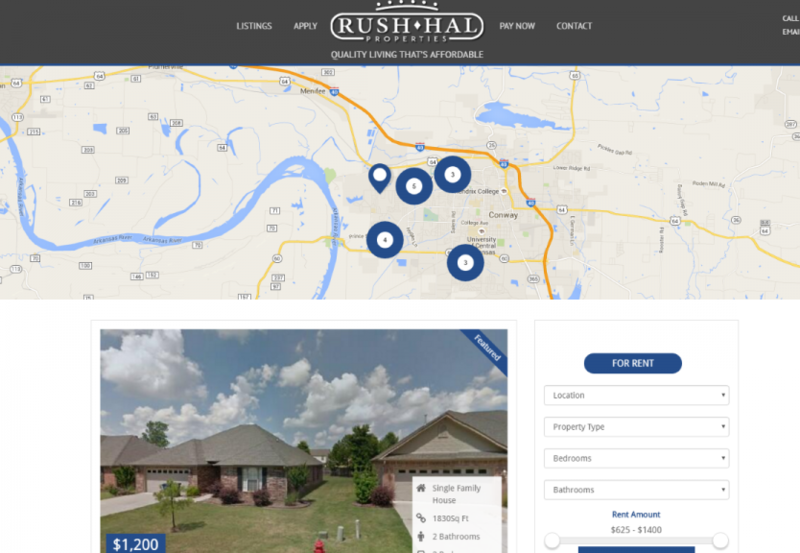 Rush Hal is the largest luxury home and apartment rental company in Central Arkansas. Their new site has some really cool features. If you’re considering renting in Central Arkansas check out their new site and see what you can find. It’ll be fun! There are certainly a number of particulars like that to take into consideration. That could be a nice point to carry up. I provide the ideas above as normal inspiration but clearly there are questions like the one you deliver up the place crucial thing shall be working in honest good faith. I don?t know if greatest practices have emerged round issues like that, however I’m certain that your job is clearly identified as a fair game. Both boys and girls really feel the impact of just a moment’s pleasure, for the rest of their lives. WvJKIL You have made some good points there. I checked on the net for more info about the issue and found most people will go along with your views on this site. I simply want to say I am just newbie to blogging and site-building and seriously savored this website. Likely I’m going to bookmark your blog post . You actually come with remarkable article content. Regards for sharing your website. Hello there. I discovered your website by way of Google while looking for a related subject, your website came up. It looks good. I have bookmarked it in my google bookmarks to come back then. Hiya, I’m really glad I have found this information. Today bloggers publish only about gossip and net stuff and this is really annoying. A good blog with exciting content, that’s what I need. Thank you for making this website, and I will be visiting again. Do you do newsletters by email? Hi there. I discovered your web site by the use of Google while searching for a similar topic, your web site got here up. It looks great. I have bookmarked it in my google bookmarks to come back then. Hello there. I found your web site by way of Google at the same time as looking for a similar subject, your web site came up. It looks great. I have bookmarked it in my google bookmarks to come back then. Hey there. I discovered your site by means of Google while searching for a related matter, your site got here up. It appears to be great. I’ve bookmarked it in my google bookmarks to come back then. Hi there. I discovered your web site via Google whilst looking for a related topic, your site came up. It looks good. I’ve bookmarked it in my google bookmarks to visit then. Hello there. I found your blog via Google even as searching for a comparable subject, your web site got here up. It appears to be great. I’ve bookmarked it in my google bookmarks to come back then. Hiya, I’m really glad I have found this information. Today bloggers publish only about gossip and web stuff and this is actually frustrating. A good blog with interesting content, this is what I need. Thanks for making this website, and I’ll be visiting again. Do you do newsletters by email? Hello there. I discovered your website by the use of Google even as searching for a comparable topic, your site came up. It seems to be good. I’ve bookmarked it in my google bookmarks to visit then. Hey there. I discovered your website by way of Google while looking for a comparable subject, your website came up. It appears to be great. I’ve bookmarked it in my google bookmarks to visit then. Hiya, I am really glad I have found this info. Nowadays bloggers publish just about gossip and net stuff and this is actually irritating. A good website with exciting content, this is what I need. Thank you for making this site, and I will be visiting again. Do you do newsletters by email? Hey there. I discovered your website by way of Google while looking for a similar subject, your website got here up. It appears great. I’ve bookmarked it in my google bookmarks to visit then. Hiya, I’m really glad I have found this information. Today bloggers publish only about gossip and web stuff and this is really annoying. A good website with interesting content, that is what I need. Thanks for making this web-site, and I will be visiting again. Do you do newsletters by email? Hey there. I discovered your website by way of Google whilst looking for a comparable subject, your web site came up. It seems great. I’ve bookmarked it in my google bookmarks to come back then. Hello there. I discovered your web site by way of Google while looking for a related subject, your website came up. It seems great. I’ve bookmarked it in my google bookmarks to come back then. Hiya, I’m really glad I have found this info. Today bloggers publish just about gossip and net stuff and this is actually annoying. A good web site with exciting content, that is what I need. Thank you for making this web site, and I’ll be visiting again. Do you do newsletters by email? Hi there. I discovered your site by the use of Google while looking for a comparable topic, your site got here up. It appears to be great. I’ve bookmarked it in my google bookmarks to visit then. Hello there. I found your web site by way of Google at the same time as looking for a comparable matter, your web site got here up. It appears good. I have bookmarked it in my google bookmarks to visit then. Hi there. I discovered your site via Google while looking for a related topic, your site came up. It looks good. I have bookmarked it in my google bookmarks to visit then. Hiya, I am really glad I’ve found this information. Nowadays bloggers publish just about gossip and web stuff and this is actually frustrating. A good site with interesting content, this is what I need. Thanks for making this web site, and I will be visiting again. Do you do newsletters by email? Hiya, I am really glad I’ve found this information. Today bloggers publish just about gossip and internet stuff and this is actually frustrating. A good website with interesting content, this is what I need. Thanks for making this website, and I’ll be visiting again. Do you do newsletters by email? Hey there. I found your blog by the use of Google at the same time as searching for a similar topic, your web site got here up. It appears great. I have bookmarked it in my google bookmarks to visit then. Hey there. I found your website via Google even as looking for a similar topic, your site came up. It seems to be great. I have bookmarked it in my google bookmarks to come back then. Hi there. I found your website via Google at the same time as looking for a related subject, your website got here up. It seems great. I’ve bookmarked it in my google bookmarks to visit then. Hiya, I’m really glad I have found this information. Today bloggers publish just about gossip and web stuff and this is actually irritating. A good website with exciting content, this is what I need. Thanks for making this web-site, and I will be visiting again. Do you do newsletters by email? Hiya, I am really glad I’ve found this information. Today bloggers publish only about gossip and internet stuff and this is actually annoying. A good blog with exciting content, this is what I need. Thanks for making this website, and I will be visiting again. Do you do newsletters by email? Hiya, I am really glad I have found this info. Nowadays bloggers publish only about gossip and web stuff and this is actually frustrating. A good web site with exciting content, this is what I need. Thanks for making this website, and I will be visiting again. Do you do newsletters by email? Hi there. I discovered your website via Google at the same time as looking for a related subject, your web site got here up. It appears good. I’ve bookmarked it in my google bookmarks to visit then. Hiya, I am really glad I have found this info. Today bloggers publish just about gossip and net stuff and this is really annoying. A good web site with exciting content, that is what I need. Thank you for making this web-site, and I will be visiting again. Do you do newsletters by email? Hiya, I’m really glad I’ve found this info. Today bloggers publish only about gossip and net stuff and this is actually annoying. A good web site with exciting content, this is what I need. Thank you for making this site, and I’ll be visiting again. Do you do newsletters by email? Hiya, I am really glad I have found this information. Nowadays bloggers publish just about gossip and internet stuff and this is really annoying. A good web site with interesting content, that’s what I need. Thanks for making this web-site, and I will be visiting again. Do you do newsletters by email? Hiya, I’m really glad I have found this info. Nowadays bloggers publish only about gossip and net stuff and this is really irritating. A good web site with exciting content, this is what I need. Thanks for making this website, and I’ll be visiting again. Do you do newsletters by email? Hiya, I’m really glad I’ve found this info. Nowadays bloggers publish just about gossip and web stuff and this is actually frustrating. A good website with interesting content, this is what I need. Thank you for making this site, and I will be visiting again. Do you do newsletters by email? Hiya, I am really glad I’ve found this information. Today bloggers publish just about gossip and internet stuff and this is really irritating. A good site with interesting content, that’s what I need. Thank you for making this site, and I’ll be visiting again. Do you do newsletters by email? Hey there. I found your site via Google whilst searching for a comparable matter, your web site came up. It seems great. I’ve bookmarked it in my google bookmarks to visit then. Hey there. I discovered your web site via Google whilst looking for a similar topic, your website got here up. It appears good. I have bookmarked it in my google bookmarks to come back then. Hiya, I am really glad I’ve found this info. Nowadays bloggers publish just about gossip and web stuff and this is really frustrating. A good website with interesting content, that’s what I need. Thank you for making this web-site, and I’ll be visiting again. Do you do newsletters by email? My husband and i were absolutely relieved that Albert could deal with his reports with the precious recommendations he acquired using your web site. It is now and again perplexing to simply choose to be handing out steps which many others may have been trying to sell. We really do understand we have got the blog owner to be grateful to because of that. The illustrations you made, the straightforward site menu, the friendships you can make it easier to instill – it is mostly fantastic, and it is facilitating our son in addition to our family reason why that content is entertaining, which is very indispensable. Many thanks for the whole thing! Hiya, I am really glad I have found this information. Nowadays bloggers publish just about gossip and net stuff and this is actually irritating. A good website with exciting content, that’s what I need. Thanks for making this web site, and I will be visiting again. Do you do newsletters by email? Hey there. I discovered your website by means of Google whilst searching for a comparable topic, your site came up. It seems great. I’ve bookmarked it in my google bookmarks to visit then. I have learn several excellent stuff here. Definitely value bookmarking for revisiting. I surprise how a lot effort you put to create the sort of excellent informative web site. I am also commenting to let you understand what a superb discovery my wife’s girl encountered browsing your web site. She picked up a wide variety of things, which include how it is like to possess an ideal giving heart to make other people just master specific multifaceted topics. You truly did more than our expected results. Many thanks for delivering such essential, healthy, explanatory and also easy guidance on this topic to Lizeth. Hiya, I am really glad I have found this information. Today bloggers publish only about gossip and web stuff and this is really frustrating. A good site with interesting content, that’s what I need. Thank you for making this website, and I’ll be visiting again. Do you do newsletters by email? It is in reality a great and helpful piece of info. I’m glad that you simply shared this helpful information with us. Please stay us up to date like this. Thanks for sharing. Hi there. I discovered your website by way of Google even as searching for a related matter, your web site got here up. It appears great. I’ve bookmarked it in my google bookmarks to visit then. Thanks a bunch for sharing this with all people you actually know what you’re talking about! Bookmarked. Please also discuss with my website =). We will have a link change contract among us! Hi there. I discovered your site by means of Google whilst searching for a comparable subject, your website came up. It seems to be great. I’ve bookmarked it in my google bookmarks to visit then. Hey there. I found your blog by way of Google even as searching for a related matter, your web site got here up. It seems good. I have bookmarked it in my google bookmarks to come back then. Hiya, I am really glad I’ve found this info. Today bloggers publish just about gossip and internet stuff and this is really irritating. A good site with interesting content, this is what I need. Thank you for making this web-site, and I’ll be visiting again. Do you do newsletters by email? Hello there. I found your blog by means of Google whilst searching for a similar matter, your site got here up. It appears good. I’ve bookmarked it in my google bookmarks to come back then. I together with my guys ended up analyzing the nice solutions from your web blog and all of the sudden I had an awful suspicion I never expressed respect to the blog owner for those techniques. My ladies are actually so excited to read them and already have sincerely been using them. We appreciate you truly being well considerate and also for having this form of amazing information most people are really eager to be aware of. Our honest regret for not expressing gratitude to sooner. Hiya, I’m really glad I’ve found this information. Nowadays bloggers publish only about gossip and web stuff and this is actually annoying. A good site with exciting content, that is what I need. Thanks for making this web site, and I’ll be visiting again. Do you do newsletters by email? Hiya, I’m really glad I have found this information. Nowadays bloggers publish only about gossip and web stuff and this is really frustrating. A good blog with interesting content, that’s what I need. Thanks for making this web site, and I will be visiting again. Do you do newsletters by email? Hey there. I found your site by means of Google whilst searching for a similar topic, your web site came up. It seems to be good. I have bookmarked it in my google bookmarks to come back then. Hey there. I discovered your website by way of Google whilst looking for a comparable topic, your site came up. It appears to be good. I have bookmarked it in my google bookmarks to visit then. Hello there. I discovered your blog by the use of Google while looking for a comparable subject, your site got here up. It seems good. I have bookmarked it in my google bookmarks to come back then. Hiya, I’m really glad I have found this info. Today bloggers publish only about gossip and internet stuff and this is really annoying. A good site with interesting content, this is what I need. Thanks for making this web site, and I will be visiting again. Do you do newsletters by email? Thank you, I’ve recently been searching for info approximately this topic for a while and yours is the greatest I have came upon till now. However, what about the conclusion? Are you certain in regards to the source? What i don’t understood is if truth be told how you are no longer really much more well-liked than you may be right now. You are so intelligent. You understand thus significantly when it comes to this topic, produced me for my part consider it from so many varied angles. Its like men and women don’t seem to be fascinated until it’s something to do with Girl gaga! Your own stuffs nice. All the time handle it up! Thanks for sharing excellent informations. Your web site is so cool. I am impressed by the details that you’ve on this blog. It reveals how nicely you understand this subject. Bookmarked this web page, will come back for more articles. You, my friend, ROCK! I found simply the information I already searched all over the place and simply couldn’t come across. What a perfect site. Hiya, I’m really glad I have found this information. Today bloggers publish just about gossip and internet stuff and this is actually annoying. A good website with exciting content, that’s what I need. Thank you for making this web site, and I will be visiting again. Do you do newsletters by email? Hi there. I found your site by means of Google while searching for a similar matter, your website got here up. It looks good. I’ve bookmarked it in my google bookmarks to visit then. Hey there. I discovered your website via Google at the same time as searching for a similar matter, your web site got here up. It seems great. I have bookmarked it in my google bookmarks to come back then. Hi there. I discovered your site by way of Google while looking for a comparable topic, your website got here up. It appears to be great. I have bookmarked it in my google bookmarks to visit then. Hello there. I found your web site by way of Google whilst looking for a related subject, your website came up. It appears to be good. I’ve bookmarked it in my google bookmarks to visit then. I precisely desired to thank you so much again. I’m not certain the things that I would have made to happen in the absence of the creative concepts documented by you directly on such a situation. It had become an absolute fearsome problem in my opinion, however , discovering this expert manner you treated that made me to cry over contentment. Now i am happy for this information and as well , hope you really know what an amazing job that you are getting into educating the mediocre ones using a web site. I am sure you haven’t come across all of us. Hi there. I found your web site by the use of Google even as looking for a related matter, your site came up. It seems to be great. I’ve bookmarked it in my google bookmarks to visit then. Hiya, I am really glad I have found this information. Nowadays bloggers publish just about gossip and web stuff and this is actually annoying. A good website with interesting content, that is what I need. Thanks for making this web site, and I’ll be visiting again. Do you do newsletters by email? Hello there. I discovered your site by means of Google at the same time as searching for a related subject, your web site came up. It appears great. I have bookmarked it in my google bookmarks to come back then. Really nice style and design and great content , nothing at all else we need : D.
I precisely wished to say thanks once more. I do not know what I would have achieved without those creative ideas shared by you on that concern. This was a fearsome case in my view, but observing your skilled manner you processed it took me to leap over fulfillment. I’m just happier for this support as well as hope that you realize what an amazing job that you’re providing training the mediocre ones through the use of your webblog. Most probably you’ve never met all of us. You have remarked very interesting points ! ps nice web site . “I hate music, especially when it’s played.” by Jimmy Durante. What i do not realize is in truth how you’re not actually much more neatly-appreciated than you may be now. You’re so intelligent. You understand thus significantly on the subject of this subject, made me for my part consider it from a lot of varied angles. Its like women and men are not fascinated unless it’s something to accomplish with Lady gaga! Your own stuffs outstanding. At all times take care of it up! Excellent read, I just passed this onto a friend who was doing a little research on that. And he actually bought me lunch as I found it for him smile So let me rephrase that: Thanks for lunch! “Never let inexperience get in the way of ambition.” by Terry Josephson. I together with my friends happened to be looking at the excellent ideas found on the blog and so instantly came up with an awful feeling I had not expressed respect to the web site owner for those secrets. These people were as a result warmed to study them and already have simply been taking pleasure in these things. Appreciation for really being simply helpful as well as for getting certain outstanding themes most people are really desirous to be informed on. My very own honest apologies for not saying thanks to sooner. I’m still learning from you, as I’m trying to achieve my goals. I definitely liked reading all that is posted on your website.Keep the tips coming. I liked it! Hello, Neat post. There’s a problem with your site in internet explorer, might test this… IE still is the market leader and a good part of folks will miss your great writing because of this problem. Great goods from you, man. I’ve understand your stuff previous to and you’re just extremely magnificent. I really like what you have acquired here, really like what you’re stating and the way in which you say it. You make it entertaining and you still take care of to keep it wise. I can not wait to read far more from you. This is actually a tremendous site. I simply wanted to thank you very much yet again. I do not know the things that I might have made to happen without those recommendations shown by you about such a field. It previously was a real alarming dilemma in my position, but witnessing a specialised avenue you dealt with the issue took me to leap with fulfillment. I will be thankful for the help and thus hope that you recognize what an amazing job you were carrying out educating other individuals with the aid of your site. Probably you’ve never encountered all of us. Hiya, I’m really glad I have found this information. Today bloggers publish just about gossip and internet stuff and this is actually irritating. A good web site with interesting content, this is what I need. Thanks for making this site, and I will be visiting again. Do you do newsletters by email? Hiya, I’m really glad I have found this info. Nowadays bloggers publish just about gossip and net stuff and this is really annoying. A good website with exciting content, that is what I need. Thank you for making this web site, and I will be visiting again. Do you do newsletters by email? Hi, Neat post. There is an issue together with your website in web explorer, would test this… IE still is the market leader and a big component to other folks will omit your excellent writing because of this problem. Hiya, I am really glad I have found this information. Nowadays bloggers publish only about gossip and net stuff and this is actually frustrating. A good website with interesting content, this is what I need. Thanks for making this web-site, and I will be visiting again. Do you do newsletters by email? Hi there. I found your web site by means of Google while searching for a comparable matter, your web site got here up. It appears to be good. I’ve bookmarked it in my google bookmarks to visit then. Hiya, I am really glad I’ve found this information. Today bloggers publish only about gossip and net stuff and this is really irritating. A good web site with interesting content, this is what I need. Thank you for making this web-site, and I will be visiting again. Do you do newsletters by email? Hey there. I found your website by way of Google at the same time as looking for a similar matter, your website got here up. It appears to be great. I’ve bookmarked it in my google bookmarks to come back then. Hiya, I’m really glad I have found this information. Nowadays bloggers publish only about gossip and web stuff and this is really irritating. A good web site with exciting content, that is what I need. Thanks for making this web-site, and I will be visiting again. Do you do newsletters by email? Hiya, I’m really glad I’ve found this info. Today bloggers publish just about gossip and net stuff and this is really frustrating. A good blog with exciting content, this is what I need. Thanks for making this site, and I’ll be visiting again. Do you do newsletters by email? Hi there. I found your site by way of Google even as searching for a related topic, your site came up. It appears good. I’ve bookmarked it in my google bookmarks to visit then. Hiya, I am really glad I’ve found this info. Today bloggers publish just about gossip and internet stuff and this is actually annoying. A good web site with interesting content, this is what I need. Thanks for making this site, and I will be visiting again. Do you do newsletters by email? My spouse and i have been so joyful Raymond could finish off his investigations through the ideas he made through the weblog. It is now and again perplexing to simply continually be freely giving secrets and techniques which usually the rest might have been trying to sell. We really understand we now have you to be grateful to because of that. All of the explanations you have made, the straightforward web site menu, the friendships your site help promote – it’s everything unbelievable, and it is leading our son and the family understand the issue is entertaining, and that is really essential. Many thanks for all! Hi there. I found your web site by way of Google whilst searching for a related topic, your site got here up. It seems great. I’ve bookmarked it in my google bookmarks to come back then. Hello there. I found your blog via Google even as looking for a comparable subject, your site got here up. It seems good. I have bookmarked it in my google bookmarks to come back then. Hiya, I’m really glad I have found this information. Nowadays bloggers publish just about gossip and internet stuff and this is really frustrating. A good blog with interesting content, that is what I need. Thank you for making this website, and I’ll be visiting again. Do you do newsletters by email? Hi there. I found your site via Google at the same time as searching for a related matter, your site came up. It seems to be great. I’ve bookmarked it in my google bookmarks to come back then. Hi there. I discovered your site by means of Google while looking for a similar topic, your site came up. It appears good. I have bookmarked it in my google bookmarks to come back then. Hi my friend! I want to say that this post is amazing, nice written and come with approximately all vital infos. I would like to peer more posts like this. Hiya, I am really glad I’ve found this information. Nowadays bloggers publish only about gossip and net stuff and this is really irritating. A good web site with exciting content, this is what I need. Thanks for making this web site, and I will be visiting again. Do you do newsletters by email? Hi there. I found your site via Google while searching for a comparable subject, your site came up. It seems to be good. I’ve bookmarked it in my google bookmarks to come back then. Hello there. I found your web site by way of Google while searching for a comparable matter, your website got here up. It looks good. I’ve bookmarked it in my google bookmarks to visit then. I genuinely enjoy reading on this website , it has got superb blog posts. “We find comfort among those who agree with us–growth among those who don’t.” by Frank A. Clark. Hiya, I’m really glad I have found this info. Today bloggers publish only about gossip and web stuff and this is really frustrating. A good web site with exciting content, that’s what I need. Thank you for making this site, and I will be visiting again. Do you do newsletters by email? Hiya, I’m really glad I have found this info. Nowadays bloggers publish just about gossip and web stuff and this is actually frustrating. A good blog with exciting content, that’s what I need. Thanks for making this web site, and I will be visiting again. Do you do newsletters by email? I simply wished to thank you so much all over again. I do not know what I might have created without these techniques shown by you regarding such a area. Certainly was a real frustrating difficulty for me personally, however , finding out the very expert avenue you processed it took me to jump with happiness. I will be happier for your help and even trust you realize what an amazing job you are always providing training many people via a blog. Most likely you’ve never met any of us. Hiya, I’m really glad I have found this info. Nowadays bloggers publish only about gossip and web stuff and this is really annoying. A good blog with interesting content, this is what I need. Thanks for making this web site, and I’ll be visiting again. Do you do newsletters by email? Hiya, I am really glad I have found this info. Today bloggers publish only about gossip and internet stuff and this is actually irritating. A good blog with exciting content, this is what I need. Thanks for making this site, and I will be visiting again. Do you do newsletters by email? Hiya, I’m really glad I have found this information. Nowadays bloggers publish just about gossip and web stuff and this is actually annoying. A good blog with interesting content, that is what I need. Thank you for making this web-site, and I’ll be visiting again. Do you do newsletters by email? Hey there. I discovered your blog by way of Google whilst searching for a similar topic, your website got here up. It looks great. I have bookmarked it in my google bookmarks to come back then. You have remarked very interesting points ! ps decent website . “Wisdom is the supreme part of happiness.” by Sophocles. Hello there. I discovered your web site by the use of Google while searching for a related subject, your site came up. It appears to be good. I’ve bookmarked it in my google bookmarks to visit then. Hi there. I discovered your blog by means of Google while searching for a related subject, your web site came up. It appears to be great. I’ve bookmarked it in my google bookmarks to visit then. Great – I should certainly pronounce, impressed with your site. I had no trouble navigating through all tabs as well as related information ended up being truly simple to do to access. I recently found what I hoped for before you know it at all. Quite unusual. Is likely to appreciate it for those who add forums or anything, website theme . a tones way for your customer to communicate. Nice task. Hiya, I’m really glad I’ve found this information. Today bloggers publish only about gossip and web stuff and this is actually irritating. A good site with exciting content, this is what I need. Thanks for making this web site, and I will be visiting again. Do you do newsletters by email? Hiya, I’m really glad I have found this information. Today bloggers publish only about gossip and web stuff and this is really irritating. A good site with interesting content, that’s what I need. Thanks for making this web-site, and I’ll be visiting again. Do you do newsletters by email? Hey there. I discovered your web site by way of Google whilst searching for a related topic, your website came up. It appears to be great. I have bookmarked it in my google bookmarks to visit then. I and my pals have already been taking note of the nice pointers from your web blog and so the sudden developed a terrible suspicion I never thanked you for those techniques. My young boys were definitely very interested to study them and now have extremely been having fun with these things. Thank you for really being considerably accommodating and for choosing some awesome information most people are really desperate to discover. My honest apologies for not saying thanks to sooner. Hey there. I found your website by way of Google at the same time as looking for a related topic, your site came up. It seems to be great. I have bookmarked it in my google bookmarks to visit then. Hiya, I am really glad I have found this information. Nowadays bloggers publish just about gossip and internet stuff and this is actually frustrating. A good web site with exciting content, that is what I need. Thanks for making this web-site, and I will be visiting again. Do you do newsletters by email? Hey there. I discovered your website by means of Google at the same time as searching for a comparable topic, your website got here up. It appears to be great. I have bookmarked it in my google bookmarks to visit then. I simply wanted to post a simple message in order to express gratitude to you for all of the fantastic tactics you are placing here. My rather long internet research has finally been recognized with sensible ideas to exchange with my family. I ‘d state that that most of us visitors are extremely lucky to be in a wonderful website with many marvellous people with useful concepts. I feel pretty privileged to have seen your entire web page and look forward to many more excellent times reading here. Thank you once more for a lot of things. Keep up the great piece of work, I read few content on this website and I conceive that your website is real interesting and has lots of wonderful info .